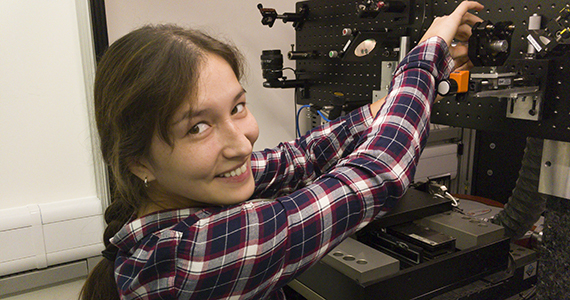 Katjana Lange is developing novel techniques for ultrafast machining of high temperature superconductor nanostructures at the Centre for Industrial Photonics. Katjana talks about some of her research findings and what she hopes to do after completing her PhD. What are you hoping to discover/solve through your research? My aim is to machine high-temperature Yttrium Barium Copper Oxide (YBCO) superconductors without degrading their electrical properties. Superconducting materials are generally very sensitive and can easily lose their superconducting properties due to heat, chemicals, humidity, ions, electrons, etc. By using an ultrafast laser, I hope to be able to directly vaporise material without any heat effects. I want to avoid all sources of possible degradation and create nano- and micro-patterned YBCO thin films that can then be used in various small-scale applications. The best-known small-scale application of this technology is in superconducting quantum interference devices, also known as SQUID magnetometers. These SQUID magnetometers are sensitive enough to measure magnetic fields generated by the heart and brain and are used in hospitals for cardiology and neural magnet field imaging. So far, what has been your biggest challenge during your PhD? One of the main challenges at the beginning of my PhD was to build up a support network of people in the superconductivity field that I could seek advice from. I did not know a lot about superconductivity and had to ask different research groups about all kinds of things, from physics to maintenance and measurement procedures. Another challenge has been the laser machining itself and understanding the laser-matter interactions. YBCO is quite a unique type of material and the laser parameters need to be chosen carefully in order not to damage it. My biggest win so far was to design my sample structure, machine it, and analyse it for incremental optimisation. I have also developed a network of people who support and provide me with knowledge and measurement technologies inside and outside the Centre for Industrial Photonics. Have there been any surprises along the way that have influenced the direction of your research? Although I knew about the complexity of laser processing, it still surprises me just how much the different parameters can influence the material’s behaviour. You often expect a certain result and get something completely different. What was it that made you interested in studying precision engineering? I have always been interested in machines and the way that the parts work together to make something new. What fascinated me about precision engineering was that all parts have to work together on an incredibly small scale. Suddenly, you need to consider the air movement in the lab or some other small ‘invisible’ influence, which can seem ridiculous for common ‘rough’ engineering applications. What would you like to do after you complete your thesis? After completing my thesis, I would like to work in the superconductivity or watch industry. What do you like to do outside of your research? Outside of my research I am basically investing all of my free time into ballroom and Latin dancing. Most of the weekends during the dance season I am travelling throughout UK to compete. For those competitions I train up to five days a week.